Debby and Steve Haskard from Adelaide, South Australia are doing their first grand tour of Europe (including pieces of Africa and Asia). During the planning stage Debby drew a line between Adelaide and Holland, where they’re joining a big international family reunion later this month and discovered that the line passed close by Spain. 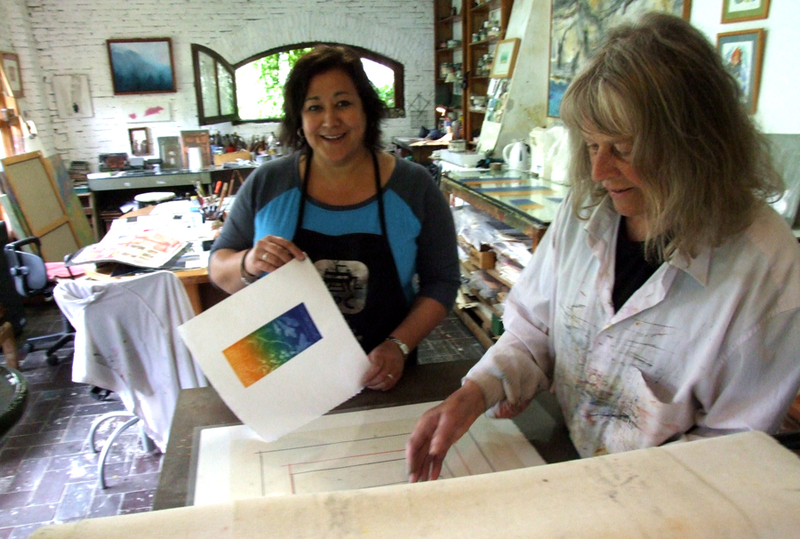 “What a great opportunity to visit Maureen Booth’s studio in Granada and spend a few days working with her,” thought Debby, who makes prints at the Adelaide Centre for the Arts. They showed up here last week and got installed in the Gallinero. Debby, who has degrees in illustration/design and fine art, hit the ground running in the studio the next morning, taking to solarplate and liquid metal printmaking like a duck to a goldfish bowl. Steve, who is a good sport, worked as their studio helper part of the time and strolling the streets of Granada when he could get away. The visit was all too short, but Debby responded brightly to Maureen’s instruction and inspiration and took home a fat folder of prints. See more of Debby’s work here on her Facebook page.